The Andriy Yarmolenko to Borussia Dortmund transfer saga could finally end this week. In the last 24 months, Yarmolenko came close to joining die Schwarzgelben on two occasions. Back in the summer of 2015 Dortmund’s sporting director Michael Zorc wanted to bring in Yarmolenko to strengthen the forward line. Dynamo Kyiv, however, were a stubborn negotiation partner. The Ukrainian club owned by the Surkis brothers can be tough negotiation partners at the best of times. Ihor Surkis, who runs the day to day operations of the club, had promised Yarmolenko that he would be free to leave the club should Dynamo win a championship. Dynamo had wrestled away Ukraine’s top spot from Shakhtar Donetsk that season. Yarmolenko, therefore, should have been allowed to go. But the Surkis brothers retracted their promise and put a hefty price tag on the forward. Yarmolenko was in an uproar and even hired Mino Raiola to help him get a move abroad. In theory that should have been good news for Borussia Dortmund after all the agent helped Henrikh Mkhitaryan force a move from Ukraine to Borussia Dortmund. But the Surkis brothers acted and offered the Ukrainian a contract extension worth $5 million a season almost tax-free thanks to Dynamo Kyiv’s creative bookkeeping and promised that they would let Yarmolenko go after the group stage of the UEFA Champions League. Hence, Borussia Dortmund signed the talented Adnan Januzaj on loan from Manchester United. The then 20-year-old, however, could not fulfil his promise and was sent back to Manchester United after just a half-season at Borussia Dortmund. As a result of Zorc once again approached Dynamo Kyiv in January 2016. This time the transfer was real close. Yarmolenko even travelled to Borussia Dortmund to check out apartments. But Dynamo proved once again to be a difficult negotiation partner for Borussia Dortmund. With the time running out in the transfer window and with the Surkis brothers once again throwing up roadblocks Dortmund ended up walking away from the deal. In hindsight, it appeared that this might have been the last realistic chance for Yarmolenko to move abroad. Dynamo Kyiv were drawn against Manchester City in the UEFA Champions League and then successfully defended the title in Ukraine. But the Ukrainian Premier League struggled. The war in the Donbass and economic problems meant that the league quickly shrunk from 16 to 12 teams over the last three seasons. Nowadays the Ukrainian Premier League is a two horse race between Shakhtar and Dynamo. But even the two top teams had to sell many of their top players to clubs from abroad. As a result, Yarmolenko has somewhat stagnated playing in the Ukrainian Premier League. The truth is two years ago would have been the perfect moment for him to leave the league and test himself abroad. Yarmolenko is a fast and athletic striker with a lot of power. He can play all three positions up front. The fact that he started as a striker meant that he has often been compared to Andriy Shevchenko. In truth, the two are completely different players. Yarmolenko is much better playing on the right wing, which allows him to cut in and use his powerful left footed shot to finish off attacking moves. The first time I saw Yarmolenko play at a Ukrainian national team game against Cameroon in June 2013 I was asked by a Ukrainian journalist, who could potentially make the step to the West right away—watching the game I quickly identified Yarmolenko. He reminded me of Bayern’s Arjen Robben I said to my friend. Yarmolenko has scored 137 goals and 89 assists in 339 games for Dynamo Kyiv. He has added another 29 goals in 69 games for the Ukrainian national team. This season he has already scored three goals and one assist in five Ukrainian Premier League games. The current numbers are especially impressive given that Dynamo are in a massive rebuild at the moment. Dynamo Kyiv have had financial problems ever since the Ukrainian government has nationalised PrivatBank. The bank, which used to be owned by the oligarch Ihor Kolomoyskyi, also holds the financial assets of the Surkis brothers. Rumours have it that their accounts have been frozen, which in turn means that Dynamo now faces financial problems. 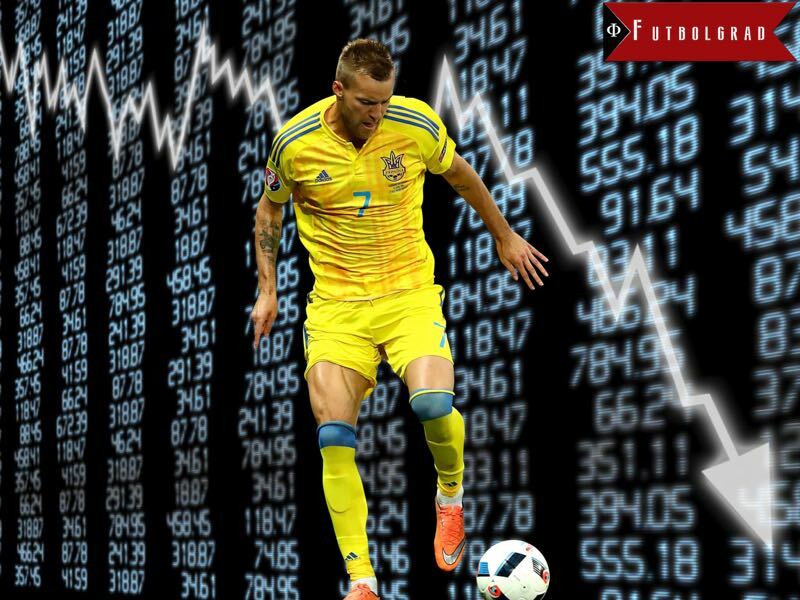 Dynamo, therefore, needs money and Yarmolenko is their only viable asset. It is for that reason that Dynamo are now open to sell Yarmolenko. The financial problems also put Dortmund in the driver’s seat in the negotiations, which means that they only have to pay a small fraction of the €148 million earned from the Ousmane Dembélé transfer on the Ukrainian winger. What kind of player will Dortmund get in Yarmolenko? The comparison to Robben is still there. Yarmolenko is a straightforward player, who is almost impossible to stop when he hits full stride. This could potentially make him a perfect player for Borussia Dortmund head coach Peter Bosz. Yarmolenko is, in fact, a perfect player for Bosz’s 4-3-3 system as he can be used as a striker and winger in the system. Another upside is his experience and the fact that unlike the many young talented players that have been linked to Dortmund Yarmolenko could step into the first squad right away. Despite the upsides, there are also plenty of downsides. Yarmolenko has somewhat regressed in the last two seasons. Furthermore, he is a pure attacking player, who thanks to the lower level of the Ukrainian Premier League never learned how to backtrack properly. He will also have to be schooled to play the high-intensity Gegenpressing style preferred by Bosz—whether he can still learn that at 27 is a major question. Hence, there are upsides and downsides to this deal. Yarmolenko could end up being the next Mkhitaryan, who can eventually take the Bundesliga by storm. The danger, however, is that he could also become the next Douglas Costa—a flashy player, who is not quite capable of playing the high press intensity game played in Germany.